Acorn Product Development, which is exhibiting at this week’s RoboBusiness conference, discusses why it’s improtant to design for the robots as a service, or RaaS, model. The robots as a service, or RaaS, business model is alive and well as a way of conserving upfront capital. With the explosive growth in cloud-based storage, computing, and commerce, SaaS (software as a service) business models are already a fact of life in business. The advantages are many, including more predictable costs, less upfront capital outlay and in many cases, easier and less costly deployment and maintenance and support costs. Providers of SaaS solutions offer management, analytical, and other data-related services along with the base level services provided. The robotics industry is no exception, with a number of companies also offering RaaS business models. From drones to perform surveys for agriculture and mobile telepresence robots used for security, to mobile robots for healthcare and more, many robotics suppliers are expanding their businesses. Robots as a service enables them to lower the technical and financial barriers to implementation and deployment. “The general trend among many technology providers is a long-term migration away from selling products to selling services beyond the usual incremental revenue from support, maintenance and upgrades charges,” said Dan Kara, practice director for robotics at research firm ABI Research. He will also be delivering a Market Forecast on the state of the robotics industry at RoboBusiness 2017. So what does this mean for the robotics suppliers designing systems for the Robots as a Service business model? This depends somewhat on how the service provider views the use model for the robots it is providing, as well as the type of robot being provided. Qihan’s Sanbot is offered in an RaaS model. For example, if the robot is mobile, you may want to include GPS/location tracking so that the provider can track (and perhaps monitor) the location of the robot, much like automotive companies track leased vehicles. As the service provider is also likely going to be responsible for maintenance of the robot, monitoring the health of key components or subsystems of the robot will also likely be required. This requires communication capability back to the service provider. 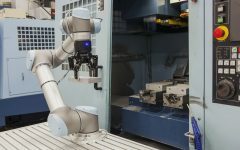 In cases where uptime for the robot is a critical factor, or where access or repairs to a robot could be very expensive, designed-in redundancy for critical systems should also be considered where feasible. Service providers can also enhance their offerings by providing metrics to help the client. For example, warehouse robots could be monitored for how and where inventory is being accessed within the warehouse, along with how long it takes to access the inventory. This data could be used to optimize the location of higher-volume inventory within the warehouse, reducing access time and improving efficiency. Robotics as a Service providers can take advantage of scalable cloud-based computing platforms to provide a wide range of computational power. By capturing and analyzing data gathered by robots in their environment, they can give valuable real-time insights into business operations. This cloud-based approach is viewed far more favorably by customers compared with purchasing hardware that they own and would need to maintain. The “as a service” model for robotics is clearly in its infancy, and may represent the fastest growth potential for the adoption of robotics. Designing robots to successfully provide these types of services requires companies to look at the entire scope of the problem in order to develop a comprehensive set of requirements. Founded in 1993, Acorn Product Development is based in Silicon Valley with design centers in Boston, Atlanta, and China. We provide comprehensive product engineering services, including turnkey product development, subassembly development, and engineering analysis. We also provide materials cost analysis and manufacturing cost reduction to leading companies around the globe. We embrace collaboration, simplify complex engineering challenges, establish supply chains, and plan for manufacturing and delivery. Our proven expertise, relationships, and processes help our clients bring innovative, reliable, and cost-effective products to market quickly while maintaining profitability throughout their life cycles. Robotics design is a core competency — Acorn has designed a number of robots and robotic-based systems for a wide variety of applications and markets, from robotics based high-speed electronics test systems to semi-autonomous robots for use in first-responder type situations. All systems designed by Acorn share a common requirement: They must be designed to be manufacturable in the volumes required and meet both cost and performance criteria. Editor’s Note: Ken Haven, CEO of Acorn Product Development, will be participating in the “Working With Partners to Adopt Robotics” panel at RoboBusiness 2017 this week. Acorn will also be exhibiting at the conference in Santa Clara, Calif.